The Martin D-35 Dreadnought acoustic guitar known for its strong bass response is an ideal choice for bluegrass and folk music styles. Crafted from a Sitka spruce top and East Indian rosewood back and sides the D-35 also features a three-piece back. 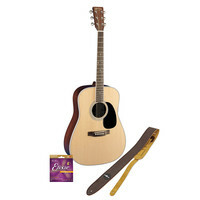 The D-35 also comes with a free set of Elixir .011-0.52 acoustic guitar strings and a Gear4music guitar strap in Tan.